For the second month in a row, we’re seeing a familiar story … inventory constraints are easing slightly, selling prices are continuing their upward trend, but fewer homes are selling. Inventory, which had been down as much as (-25%) over last year, is only down (-11.1%) in the last reporting period, with 429 fewer homes available for sale. Perhaps reflecting the lack of desirable inventory, the number of homes sold was down (-21.7%) over the same month last year. At the same time, the average selling price rose (+12.4%) to $485,000 and the average selling price per square foot rose (+12.8%) to $247. Homes continue to sell quickly, with Days on Market down (-11.5%) to 77 days. Trendvision’s® most recent year-over-year, December 2018 vs. December 2017 Report show that the largest increase in home sales last month took place $1M+ price band, with a (+5.0%) increase in the number of homes sold. Home sales in the Under $499,999 price point dropped for the second month in a row, with (-21.7%) fewer homes selling, while the $500,000 - $999,999 price band saw the largest drop in sales, a (-27.9%) drop. 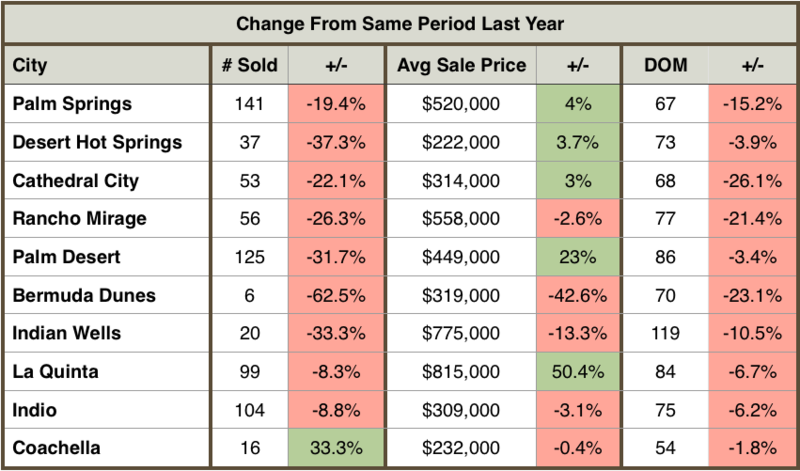 Average selling prices rose both in all price categories, with the largest percentage increase in the $1M+ category, with a strong (+23.4%) increase in average selling price. The $500,000 - $999,999 and Up to $499,999 price bands saw smaller gains, with average selling prices rising by (+1.5%) and (+4.2%) respectively. Let’s look at the three key market indicators, Average Sold Price, Number of Homes for Sale, and Number of Days on Market, for a good snapshot of the Palm Springs area real estate market and, its overall health. Average Home Sold Prices rose overall in the Palm Springs area by (+12.3%) over the same month last year. The $1M+ price range saw the biggest increase, (+23.4%) over December of last year, while the under $500,000 price range saw average selling prices rise (+4.2%). Selling prices for homes priced $500,000 - $999,999 rose slightly, by (+1.5%). Number of Days on Market dropped (-11.5%) overall compared to December of last year, with the biggest change in the Up To $499,999 price range, with a (-14.3%) reduction in Days on Market. Homes priced to $499,999 sold faster with Days on Market dropping (-4.3%) and homes priced $1M+ saw Days on Market drop by (-1.9%). Overall homes were selling in an average of 77 days. The Number of Homes for Sale. Inventory problems are starting to ease a bit as we see more homes come on the market during season, yet inventory was still (-11.1%) lower than December 2017. Inventory shortages are hitting homes priced Up To $499,999 the hardest, with (-15.6%) fewer homes available in that price band. For homes priced $500,000 - $999,999, inventory was down (-4.8%) over the same time last year. Inventory was down (-6.6%) for homes priced $1M and above. While inventory woes have eased somewhat, as we have seen all year, buyers have fewer homes to choose from, and sellers are finding they can command higher prices for their homes if they are in good condition and properly priced. City Standouts! What’s Up and Who’s Down? For the second month in a row, the Number of Homes Sold in December 2018 vs. December 2017 was down across the Palm Springs area. The number of homes sold was down all cities except for Coachella, which saw a (+33.3%) increase in home sales. The largest percentage drop in home sales was in Bermuda Dunes, down (-62.5%), Desert Hot Springs down (-37.3%), Indian wells down (-33.3%), and Palm Desert down (-31.7%). When looking at Average Selling Price, La Quinta saw the largest percentage increase with a (+50.4%) rise in average selling prices. Palm Desert selling prices rose (+23.0%) last month and Palm Springs, Desert Hot Springs, and Cathedral City saw price increases of (+4,0%), (+3.7%), and (+3.0%) respectively. The Number of Days on Market was down across the board, with homes selling fastest this month in … Cathedral City (-26.1%), Bermuda Dunes (-23.1%), Rancho Mirage (-21.4%), and Palm Springs (-15.2%). If you'd like a detailed market report for a specific city, just click here: Send Me A City Report. Give us a call at (760) 625-7229, or visit www.thehamiltonregroup.com, for an easy-to-use home search, and for information on how we can help you with all your important real estate needs. 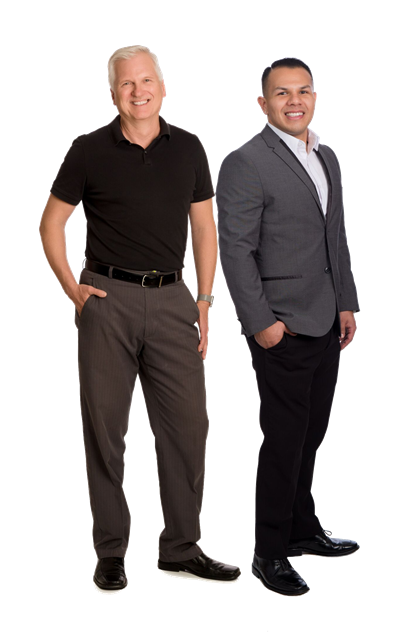 The Hamilton Real Estate Group is evolving to meet all of our customer’s real estate needs. If you are ready to sell, call or email us, or for a FREE instant home valuation report, click here: What's My Home Worth?